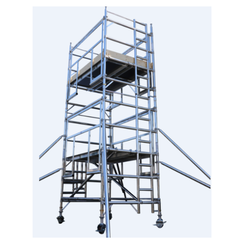 With the aid of modern tools and sophisticated technologies, we have been able to provide the customers with Scaffolding Unit. We have manufactured and processed this range using high grade metal in order to ensure its resistance against and other harming properties. These are available at market leading rates. 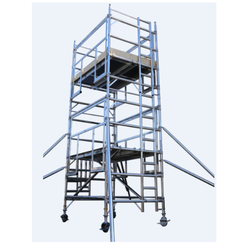 Made as per the predefined standards of the industry and fulfilling various industrial demands, the offered range of these Mobile Scaffold Units is availed to the customers in the most comprehensive prices. We have manufactured and processed this range using high grade metal in order to ensure its resistance against and other harming properties. We can assure our customers that the offered range of Scaffolding Units has been made as per the industrial standards. Available with us in a variety of specifications, this range has been manufactured using quality metal only which is procured from the reliable vendors. Given a reliable and sturdy structure, this range is of high quality. We are one of the leading names engaged offering the best range of Industrial Scaffolding Unit. Products that we have come with are fabricated by making use of high-grade required basic material and components. We are dedicated to offer our customers this range at market leading prices. 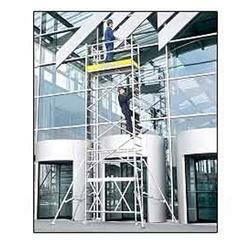 Scaffolding category 3 (can be loaded up to 200 kg/m²) according to DIN EN 1004, i.e. at width 0.75 m = 270 kg and at width 1.35 m = 486 kg. Looking for Scaffolding Unit ?